I decided, because I don’t have enough to do, that I would join The Daring Kitchen. I know. I know. This month’s Daring Cooks Challenge is by Jen from Use Real Butter who challenged us all to make homemade pot sticker wrappers. 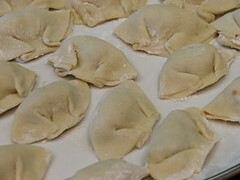 Overall, it was not terribly difficult, but it did take a little time to roll and fill the dumplings. Of course, if you have friends and family willing to help, an assembly line makes things go much faster! I would make this again for a special occasion or dinner party. If you have ever had a fresh wrapper you will be reluctant to go back to frozen wrappers. For all their ease of use, they lack flavor and a delightful texture that fresh wrappers have. 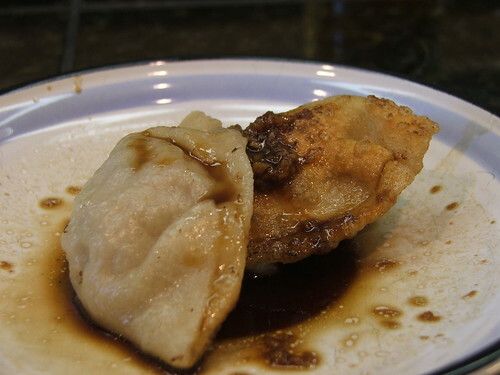 I opted for a pork filling for my pot-stickers because I was cooking them for my mother-in-law who prefers pork to any other filling. That was fine with me. 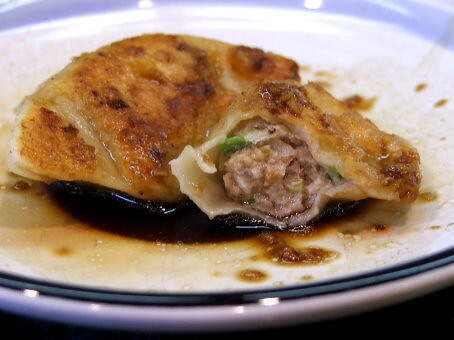 I adore pork filling with some yummy garlic soy dipping sauce. Weigh out your ingredients and mix them with a stand mixer until a smooth ball forms, about 5 to eight minutes. Cover and allow to rest at least 30 minutes, but I let mine rest, chilled, for two hours. 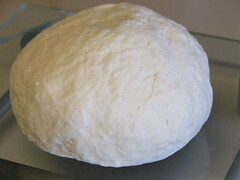 While the dough rests prepare your filling by combining all the ingredients in a large bowl. 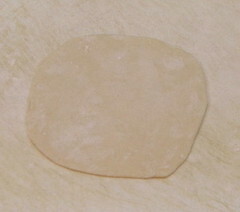 Cover and refrigerate until ready to use. Divide the rested dough into half and, working with one half at a time keeping the other half covered, divide those half into about 32 pieces. 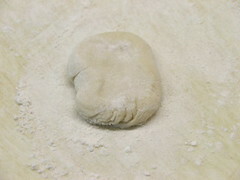 Using a straight rolling pin roll each piece into 3″ circle that is about 1/8″ thick. 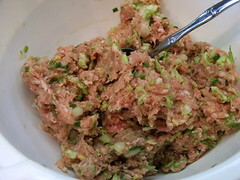 Fill the center with a tablespoon of pork filling. 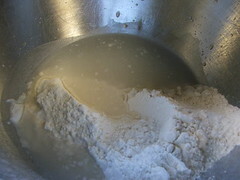 In a shallow dish make a slurry with the cornstarch and water. 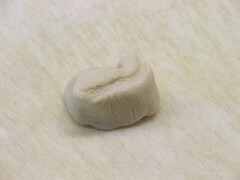 Dip your finger in the slurry and wipe it along the edge of one half of the dumpling. 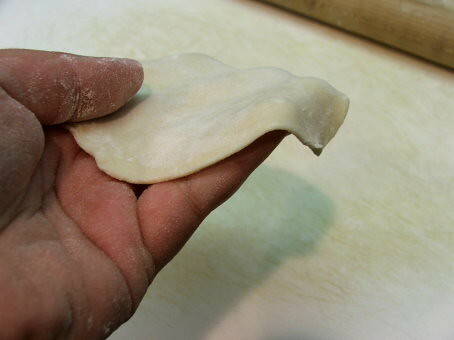 Fold the dough over and seal. Heat a pan, which has a lid, over medium heat. Add a tablespoon of oil to the pan and swirl to coat the bottom. 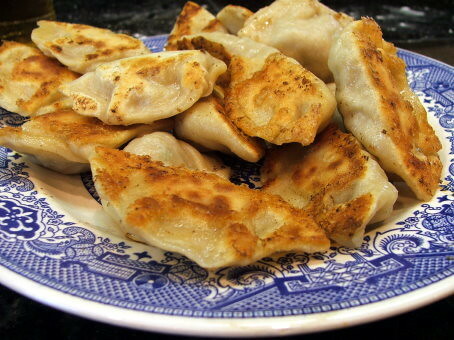 Place the dumplings in the pan and allow to fry until browned, about three minutes. 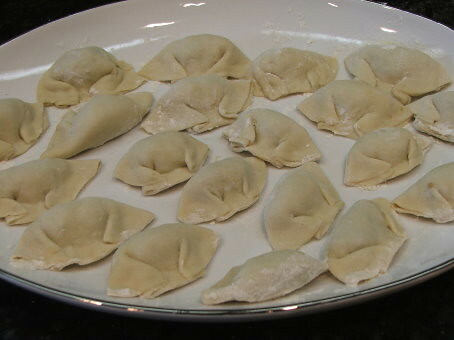 Pour in a few tablespoons of water and cover with the lid so the dumplings can steam. Allow to cook an additional five minutes. 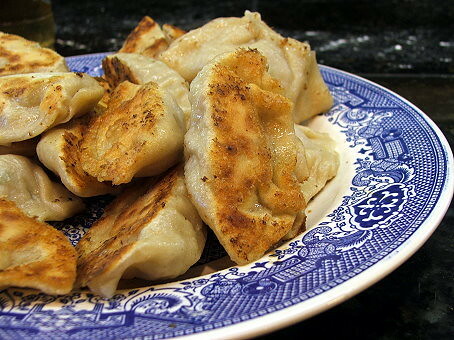 Serve the pot stickers with soy sauce mixed with some crushed garlic and a few drops of sesame oil.